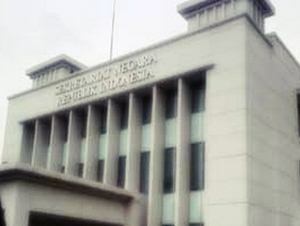 Kementerian Sekretariat Negara Republik Indonesia – SETNEG is the Ministry of State Secretariat of Republic of Indonesia. Setneg is the Indonesian ministry with main tasks to provides technical and administrative support to the president and vice president in the organizing power of the state. SETNEG is based in Jakarta and its principal office is registered at in Jl Veteran 17 – 18 Jakarta. Accodting to SETNEG The organizational structure of SETNEG comprise of Secretariat of the President, Secretariat of the Vice President, Military Secretariat of the President, Secretariat of the Ministry, Deputy Minister for Policy Support, Deputy Minister for Human Resources, Deputy Minister for Relations with Institutions and Community Organizations, Deputy Minister for Legislation Affairs, Expert Staff, Inspectorate, and Centre for Education and Training. Since 2014, the Secretary of State (Mensesneg) held by Pratikno. S1 Communication, Public/State Administration, Economics. Strong interest in media and policy. S1 Communication (Public Relation, Mass Communication), Strong interest in internal and external relations. S1 Visual Communication Design, familiar with Adobe Illustrator and Adobe Photoshop. S1 State/Public Administration, Public Policy Management. S1 Communication (Journalism), strong interest in news writting. D3/S1 Visual Communication Design, familiar with Adobe Illustrator and Adobe Photoshop. S1 English Literature, have strong interest or experience in article translation. D3/S1 Communication (Broadcasting, Mass Communication). Familiar with Adobe Premiere, Adobe Illustrator, Adobe Photoshop and Adobe Lightroom. Internship Period : 21 November 2016 – 21 Februari 2017.